Abstract. A RPG-HATPRO ground-based microwave radiometer (MWR) was operated in a deep Alpine valley during the Passy-2015 field campaign. This experiment aims to investigate how stable boundary layers during wintertime conditions drive the accumulation of pollutants. In order to understand the atmospheric processes in the valley, MWRs continuously provide vertical profiles of temperature and humidity at a high time frequency, providing valuable information to follow the evolution of the boundary layer. A one-dimensional variational (1DVAR) retrieval technique has been implemented during the field campaign to optimally combine an MWR and 1h forecasts from the French convective scale model AROME. 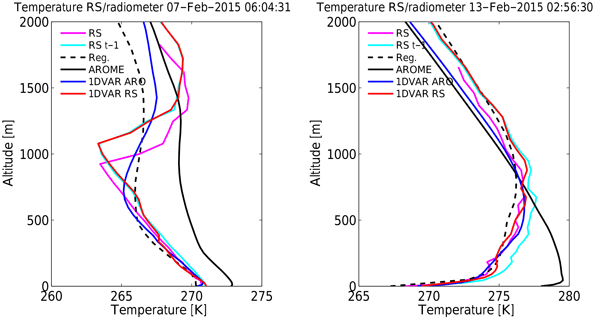 Retrievals were compared to radiosonde data launched at least every 3h during two intensive observation periods (IOPs). An analysis of the AROME forecast errors during the IOPs has shown a large underestimation of the surface cooling during the strongest stable episode. MWR brightness temperatures were monitored against simulations from the radiative transfer model ARTS2 (Atmospheric Radiative Transfer Simulator) and radiosonde launched during the field campaign. Large errors were observed for most transparent channels (i.e., 51–52GHz) affected by absorption model and calibration uncertainties while a good agreement was found for opaque channels (i.e., 54–58GHz). Based on this monitoring, a bias correction of raw brightness temperature measurements was applied before the 1DVAR retrievals. 1DVAR retrievals were found to significantly improve the AROME forecasts up to 3km but mainly below 1km and to outperform usual statistical regressions above 1km. With the present implementation, a root-mean-square error (RMSE) of 1K through all the atmospheric profile was obtained with values within 0.5K below 500m in clear-sky conditions. The use of lower elevation angles (up to 5°) in the MWR scanning and the bias correction were found to improve the retrievals below 1000m. 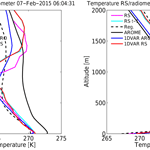 MWR retrievals were found to catch deep near-surface temperature inversions very well. Larger errors were observed in cloudy conditions due to the difficulty of ground-based MWRs to resolve high level inversions that are still challenging. Finally, 1DVAR retrievals were optimized for the analysis of the IOPs by using radiosondes as backgrounds in the 1DVAR algorithm instead of the AROME forecasts. A significant improvement of the retrievals in cloudy conditions and below 1000m in clear-sky conditions was observed. From this study, we can conclude that MWRs are expected to bring valuable information into numerical weather prediction models up to 3km in altitude both in clear-sky and cloudy-sky conditions with the maximum improvement found around 500m. With an accuracy between 0.5 and 1K in RMSE, our study has also proven that MWRs are capable of resolving deep near-surface temperature inversions observed in complex terrain during highly stable boundary layer conditions. How to cite: Martinet, P., Cimini, D., De Angelis, F., Canut, G., Unger, V., Guillot, R., Tzanos, D., and Paci, A.: Combining ground-based microwave radiometer and the AROME convective scale model through 1DVAR retrievals in complex terrain: an Alpine valley case study, Atmos. Meas. Tech., 10, 3385-3402, https://doi.org/10.5194/amt-10-3385-2017, 2017. Microwave radiometers have the capability of observing temperature and humidity profiles with a few minute time resolution. This study investigates the potential benefit of this instrument to improve weather forecasts thanks to a better initialization of the model. Our results show that a significant improvement can be expected in the model initialization in the first 3 km with potential impacts on weather forecasts.